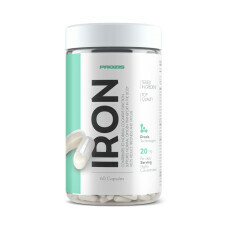 Iron is a substance of mineral origin, which is essential for the survival and good functioning of the organism. This mineral is an important part of hemoglobin and myoglobin's protein structure and as such it determines the occurrence of oxygen and carbon dioxide exchange - an essential step to the energy production process. The decrease of iron in serum is usually associated with situations of anemia and symptoms of frequent tiredness and muscle fatigue.